“We need to talk about Kevin” by Lionel Shriver, winner of the 2005 Orange Prize for Fiction, has to be one of the best – and most provocative – books I have read in years. It is both a literary feat and an excoriating account of American society, modern parenting, and the phenomenon of Columbine-style school shootings. 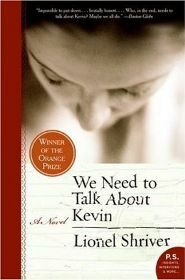 “Kevin” is shocking in two ways; firstly in its controversial perspective on parenting, and motherhood in particular, and secondly in that this book has as its subject Eva Khatchadourian, a woman who is coming to terms with the murderous actions of her teenage son whilst internally debating the extent of her own culpability for his actions. So shocking is this book that when initially presented with it, Shriver’s agent refused to send it out to publishers, worrying about the negative impact the novel would have and even that it might spark copycat crimes for which they would both implicitly bear some responsibility. Shriver rejected any notion of a self-imposed censorship of her work, however, retorting: “if you don’t allow yourself to write characters who do disagreeable things – if you only allow yourself to write about what you would be glad for your readers to imitate in real life-then you’re pretty much constrained to characters who help little old ladies across the street and rescue cats from trees, you’d never write ‘Crime and Punishment’, lest arrogant young men take axes to miserly crones”. The result is part psychological thriller, part philosophical debate into the motives for murder, and part examination of how the impact of such events affects the families of those involved. It is too simplistic to say that “Kevin” is about a high school shooting, though. Like all great books (and I think that this is a great book) it has a number of competing themes. It is as much about the pressures of parenting, the expectations that society has of women, our need to find causes (and blame) for everything, and the motivations that drive teenagers to kill their peers as it is about Kevin’s specific actions. The book takes the form of a series of exquisitely crafted confessional letters from Eva to her absent husband Franklin, narrating the story of their lives together and Kevin’s upbringing. Early on in the book we know that Kevin is in juvenile detention, convicted of shooting dead seven of his classmates, a teacher, and a cafeteria worker in his school gym shortly before his sixteenth birthday, something he clearly feels unrepentant about. As she struggles to understand this catastrophic event, Eva can only bring herself to call it “Thursday”. Over the course of her letters, Eva looks back over the peculiar, strained relationship that she has with her son, but she begins the story when she and Franklin, then in their mid 30s and happily married, decide to have a child. In a perfect world, a child would only be conceived when both partners wanted one and felt ready to be parents. In the real world, though, other factors are decisive; curiosity, a desire for some kind of immortality, and the unspoken thought that you would have some sort of tangible memento if your partner were to die. Eva’s decision to have a child is influenced by all of these, but it is only when writing to Franklin so many years later that she feels finally able to dissect her feelings and confess: “At last I should come clean. It is not true that I was ‘ambivalent’ about motherhood. You wanted to have a child. On balance, I did not.” As her narration moves through her pregnancy and the birth of her child – which Eva memorably describes as an event which left her unmoved and feeling emotionally absent – the text is both brutally honest and shockingly subversive. Many readers, especially those with children of their own, will no doubt find many early passages in the book very hard indeed to read. The story she goes on to tell is one of her struggling to love a son who appears to be the sort of child that would have Damien reaching for his security blanket. We are told that Kevin shows a propensity for malice and spite at an early age; highly intelligent and precocious, but at the same time listless and uninterested in anything around him to the point where he barely even plays. Eva is driven to distraction by him, no nanny ever manages to handle him for any length of time, while later on, classmates and even teachers display a certain wariness (even fear) of Kevin. While his mother sees this side of him, Franklin cannot – for he is truly in love with his son – a sore sticking point that was to start unravelling their once secure and passionate marriage. Some critics have slated Shriver’s novel for depicting an improbable character with almost comic book evil in Kevin, but I think that such comments miss out the fundamental point about this book: what we see, what we only see, is Eva’s perspective on the past, not the neutral third-person voice of a disembodied narrator. We have to decide for ourselves throughout the novel how much we believe and trust Eva’s point of view. As a key question is whether Kevin’s actions were influenced more by his innate nature or by the nurture of a mother who was often cold and distant towards him, it is interesting to ponder whether Eva may be exaggerating his malignancy to make herself appear less blameworthy. Some of the incidents in Kevin’s childhood that we are presented with for evidence of her son’s capacity for malice are actually quite ambiguous, and our perception is based to a large extent on Eva’s interpretation of events. Comparing these incidents in the light of the final, inevitable outcome of the book – which we know is coming, but feel powerless to stop – may cloud our judgement, but this novel certainly provides the reader with much food for thought. Shriver has her protagonist writing in an uncompromising and very opinionated style. Eva is a strong character, and cannot manage to mention anything without passing her judgement on it (often in cruel or sarcastic tones). She is a woman that you won’t always like, however much sympathy for her situation that you feel, but I think that this makes the book stronger in many ways. The style of presenting the story through a series of letters initially appeared to me to be a restrictive and limiting method, but ultimately I found it worked very well: it made Eva’s inner thoughts and recollections more intimate and (for me) inspired more empathy with her character than a narrator’s voice could have done, as we join Eva on her cathartic journey. By the end of the book you felt you knew Eva very well, which made it all the more painful reading about how she had been so bitterly hurt by Kevin. Indeed, the later parts of the book could become almost heartbreakingly unbearable to read. Ultimately, Shriver raises more questions than she answers, and even now, weeks after finishing this book, those questions and possible answers are still churning around my head. This is a book that has undeniably left an impression on me. It is one that I want to urge my friends to read so that I can have the conservations and debates about it that I want to have, and where I want to know what happens to the characters after the novel ends. And I think those are the biggest hallmarks of a book well written and utterly absorbing (“enjoyed” is perhaps not the right word; it is too uncomfortable for that). Although I want to recommend this book, I do so with a warning: it is by no means a light read, it will not give you faith in humanity, and it is more unsettling that many a horror novel. It is one that will get, and keep, you thinking though. If it is an intelligent, elegantly written book you are after, you could do a lot worse than read “Kevin“. No Comments on "We Need To Talk About Kevin"